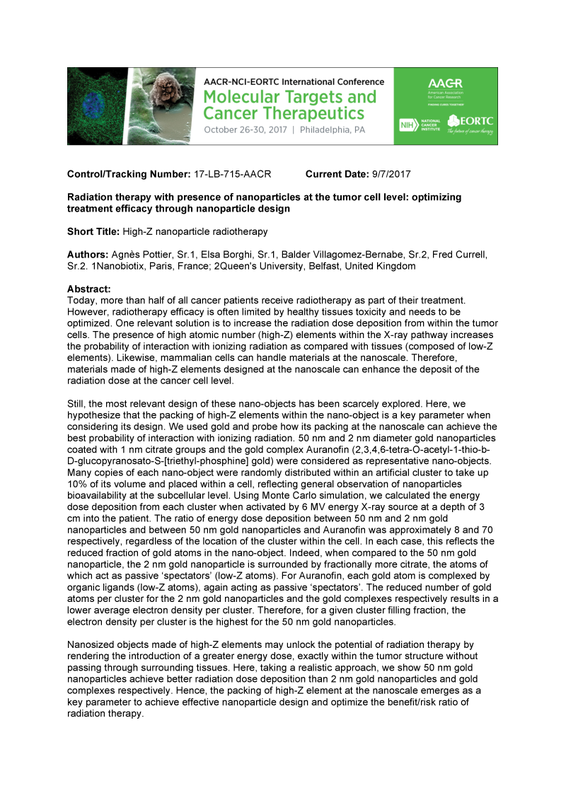 AACR-NCI-EORTC International Conference, Philadelphia · 2017, Pottier A. et al. Today, more than half of all cancer patients receive radiotherapy as part of their treatment. However, radiotherapy efficacy is often limited by healthy tissues toxicity and needs to be optimized. One relevant solution is to increase the radiation dose deposition from within the tumor cells. The presence of high atomic number (high-Z) elements within the X-ray pathway increases the probability of interaction with ionizing radiation as compared with tissues (composed of low-Z elements). Likewise, mammalian cells can handle materials at the nanoscale. Therefore, materials made of high-Z elements designed at the nanoscale can enhance the deposit of the radiation dose at the cancer cell level.